9 Years of “Wedded Bliss”?? I got to thinking about this and thought to myself, “What a horrible phrase to describe our past 9 years? !” I feel some sort of responsibility to always speak truth and to be as open and transparent as certain phases of life allow me to be. I’ve seen too many marriages–Christian in particular–crumble over the years and I believe one large reason is that they believe that “everyone else” is doing better than them. What a disservice to our brothers and sisters in Christ! While some marriages may have little conflict or issues, my guess is that a majority of them have all sorts of it. So here are some thoughts I wanted to process and write down about our 9 years of “wedded bliss”. 1.) It’s not been all wedded bliss. As a matter of fact, if you were a fly on our wall, my guess is you would actually wonder if we even liked each other at times! We are both strong personalities so when sparks fly, THEY FLY! We have had our share of ups and downs–more than I could count–in our 9 years. WE ARE NOT PERFECT. 2.) The comfort is in the commitment. I heard a Family Life Broadcast a few years ago where Dennis Rainey mentioned that the “comfort is in the commitment”. There is such comfort in knowing that Kory is committed to me–no matter what we are FEELING. And because he tells me this, it makes me want to work harder at making this work! Commitment is a foreign word in so many ways nowadays and what a shame that is. 3.) We understand that we are BIG walking TARGETS. Satan wants nothing more than to ruin our marriage. He knows that the BEST picture and representation of our relationship with Christ, is our marriage! Kory and I are daily in His Word. We are praying. We want to use the gifts God has given us. We have our own ministires we are involved in. Satan sees us–and our marriage–as a THREAT to him. I have to keep this in mind often! My fight is not against the “flesh and blood” but against something I don’t see. All those things matter–and make an impact–when you are in your marriage. It’s really hard to pinpoint that unless someone can look from the outside in and tell you. Understanding –and diving a little deeper–into those things will only HELP. 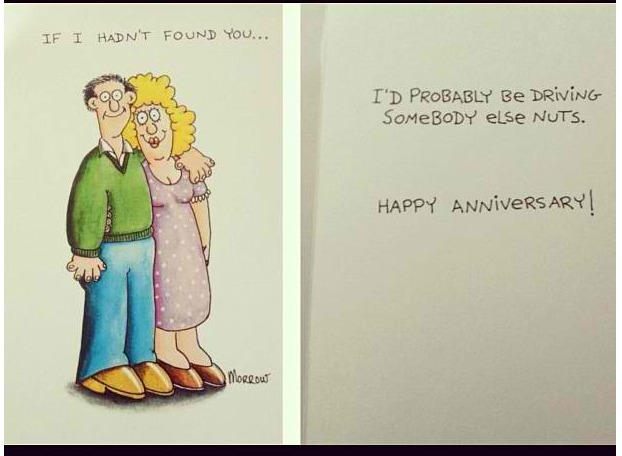 My card to Kory for our anniversary this year. No comments from the peanut gallery! LOL! 5.) It will get HARDER before it gets EASIER. There’s always a learning curve when you are trying something different. Your natural tendency is to go back to what is comfortable. (This is something to keep in mind when starting a new health habit too!) So in that, you have to be patient when trying something new. Many times this means it gets much harder than what it was before, but keep your eyes on the prize! 6.) We are better as a team than solo. 7.) It’s hard because we CARE. If I didn’t want our marriage to not only work–but be thriving and successsful– then I wouldn’t care how the climate is in our house. I wouldn’t care if I carried a chip on my shoulder, or that he was feeling disrespected. Sure, many times I WISH I didn’t care, but I know that in order for us to stay together (because that is our ultimate goal) we HAVE to care. And because we do, man, it makes it rough! Before I get any haters on this post, I want to say that I understand. Not every marriage will work out. I am not the marriage police. At the end of the day, I am only responsible for my response to my relationship with my husband–not yours. I do not have all the answers! My prayer is that you would seek God DAILY in your marriage relationship and that you would be obedient to what He has called you to do. And if you have a marriage that is doing well, THANK GOD for that—often! I am SO thankful that my husband loves God and is committed to me! I am blessed beyond measure!! Wow!! Thanks for sharing! This is awesome! Congrats on 9 years and blessing for many more!!! Thank you for sharing this and for being so “real”. It is really hard to find that these days! God bless you and your marriage!! Great stuff. It is true that when people see a happy couple they think they are just “lucky” to have found the right one. They don’t see the proactive daily work two people have to put in to have a healthy marriage. Just like physical fitness it doesn’t “just happen” by chance. Thank you so much! I’ve been married for 21 years and the last couple have been really hard. It is so easy to think, “We must be the only ones not getting this right.” Your transparency is refreshing and gives me hope. i’ve been married for 15 years, lori, & the last several years have been particularly hard for us as well. but i’m finally starting to get a bit more comfortable with the struggle — not meaning that i’m resigning, but simply that i’m starting to see them as constant excuses to cling to the Cross. Your post reminds me of two quotes from different ends of the age spectrum. One person, everybody knows. Ruth Bell Graham said “marriage is a union of two good forgivers”. The other is my pastors wife, who is 25 years younger than me and oh, so wise. You remind me of her. She and my pastor were doing a “He said, She said” series on communication, and before she spoke on how we communicate she said “First, I want to say that you DO have an enemy, but it’s not your spouse”, and she quoted John 10:10. In the context she was using it, it was probably one of the most powerful reminders I’ve heard in my 61 years. Thank you for how you care so much for the rest of us. Keep the love coming, and Happy Anniversary! I love this post! So much wisdom in here! Thanks for sharing! Nicely stated and so true. You have so much wisdom and say it in such a nice down-to-earth manner. I feel like when I read your posts we’re sitting at a coffee shop talking. Happy Anniversary and may you all enjoy many, many more years together. Thanks so much for this great reminder! I have an amazing marriage that seems to come so easily, but I forget how much time and energy my husband and I put into our marriage and how much God has blessed us! It is also great to be reminded that Satan is out to kill and destroy especially marriage because of the great picture marriage is of Christ and the Church. Excellent post! Congratulations on 9 years!!! Thank you for sharing!! So nice to read a really honest anniversary posts. Thank you for being transparent. Love your honesty and authenticity here! I completely agree we need more of that in most Christian circles. Less worldly bashing; and less my-life-is-perfect; and more real life. Hey Clare – I would completely recommend a book by Paul Tripp – “What Did You Expect?”. It has been the number one most useful resource (apart from the Bible) for my marriage and I know it would be helpful for anyone…from a struggling marriage to a healthy, thriving marriage! Thanks for your honesty in this post. Great encouragement! My husband and I are celebrating 12 years of marriage this coming week. There is so much to celebrate because we are still married and for the most part enjoy being married. The first 5 years were more about being stubborn about our commitment to marriage , we related so badly to each other and our friends use to think that we wouldn’t make it. The biggest thing has been having girlfriends to pray with during the hardest times and working with God on changing myself rather than changing the other person. Well put, Claire 🙂 Happy Anniversary to you two! Claire, Thank you so much for your thoughts and transparency. My husband and I will be married 8 years this December and I can relate to everything you just said. I’m sure that your words ministered to a lot of hearts through this post! May God keep using you to touch the lives of others for His glory! 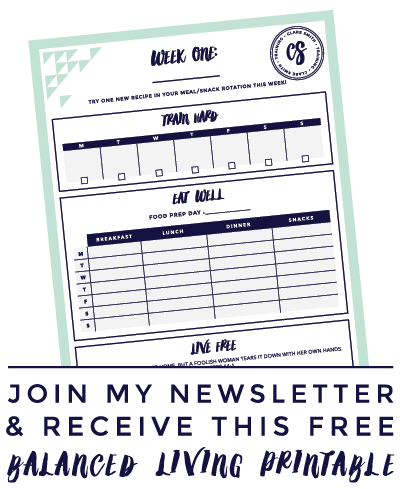 Love your blog! Love your blog! Huge fan of your workouts as well!!! My husband and I celebrated 10 years of marriage this past Thursday. I can’t believe how time has just flown by…so often not blissful…I can be quite something when I’m tired or hungry. 🙂 When I get cranky, my husband kindly suggests that I take a nap or asks if he can me a snack. Love what you said about there being comfort in the commitment. In all of our years together, we are absolutely sure about that…our commitment to one another. Praise the Lord for that!!! Thanks for your honesty and openness. Marriage is SO hard and requires a great deal of work. My husband often says, “You’ve never really been in love until you’ve been miserable.” Love is not all romance and fun, it’s sticking with your spouse through the ugliness of life. Fabulous perspective!!! We (as married people) need to do a better of giving realistic perspective to engageds. Not so much in a “scare them straight” manner, but in a realistic manner so that they know hard times WILL come….throughout your marriage….and give them the tools to use in those times. Checking in with mentors to guide, not just agree with, is a big help. Marriage is a life time roller coaster. Thanks for sharing!! I am so glad you shared this! My husband and I have been married a little over 9 years. We have also had ups and downs. We also have a child with a serious medical condition – which is very stressful. We seem to go through stages where we just fuss a lot – just not on the same page. Sometimes I wonder if we are just doing something totally wrong or if it is just that marriage is hard! Your post makes me feel a bit more like we are just riding the marriage wave. i’ve also had a huge aversion to the phrase, wedded bliss, because ultimately, it doesn’t reflect the reality that our marriages are desperately dependent on Jesus. and the glory of that reality far surpasses the myth of any bliss! Thanks for your comments, Clare. It was nice to gain some insights into how others overcome obstacles in their relationships. I’m not married yet but I’ve had similar conflicts in my dating relationships at times. It’s encouraging to realize that when my girlfriend says that she cares about me deeply she means it even though we may have serious disagreements at times that frustrate us both. Thanks for putting this in your blog. People tend to think it’s suppose to be total romance all the time. Not true. Commentment is not easy and love is not always wonderful feeling. I love my husband even when we are fighting. We got married at 43 years of age (20 years of being single and on my own before getting married again). We are both set in our ways (now married 5 years) and I must admit it’s be tough but it is getting better and so worth it. Keep God at the center of your marriage and he will help you thru it. Clare, I just got here to read this – LOVE it. I can say Amen to all of it. If marriage were perfect we wouldn’t seek a perfect relationship with God -we would be complete here! Love you girlie! Thank you so much for this post! I can relate to every single thing you spoke about! The last couple of years were especially hard in my marriage, and I can tell you that I know Satan was attacking us! At every angle too! It wasn’t until I finally confided in a friend to ask her to pray for me that I realized we would be okay. She told me that she had already been praying for us for several months because the spirit just put it on her that we were having problems. She lives 5 hours away and we rarely get a chance to speak on the phone…. You see she didn’t just know, God was fighting for us too! I’m so thankful He is on our side and I know now that He can carry us through any storm. I appreciate your transparency on this subject, because far too often we try to put on a smile and pretend everything is “bliss” when what we really need is encouragement and support from our brothers and sisters in Christ. Congratulations Clare! My DH and I have been married 32 years and 33 in July. Everything you said is so true. It takes committment and prayer for any marriage to thrive. The longer you have been married and the closer you are the bigger the threat you become to Satan. But the good news is, the longer you have been in the battle the easier it is to see where the attack is coming from. Keep up the good fight. 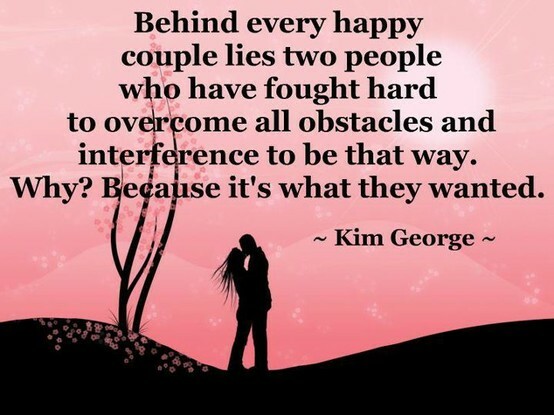 I am madly in love with my hubby all these years and 5 kids, and many trials later and I can tell you it is worth the effort!